Should I buy an acoustic or electric guitar? 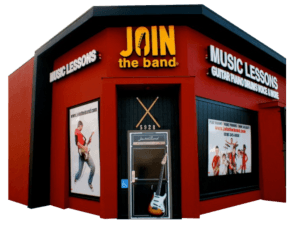 If you are new to guitar lessons either an electric or acoustic guitar will be fine. If you plan on playing rock, blues, jazz, country etc… you should buy a steel string guitar. Classical guitars are designed to play with a different technique. These guitars have nylon strings and very wide necks. Size of the guitar: For young children a 3/4 size guitar is a good choice. If you are not sure have you child hold the guitar in their lap. If they can touch the first fret with their elbow still bent at around a 45 to 90 degree angle the size of the guitar should be fine. Right vs Left handed: There are many opinions on this. Keep this in mind. They do not make or teach left handed pianos, violins, double basses, saxophones, flutes, trumpets etc…There are many left handed people that play “right handed” very well on these instruments. The only instruments offered “left handed” are electric and acoustic guitars and basses. Do I need a piano to take piano lessons? Ideally yes. 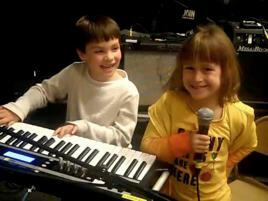 However, many students do learn on electronic keyboards. If you do purchase an electric keyboard we recommend regular sized keys and a touch sensitive keyboard. A touch sensitive keyboard means if you press a key harder it will play louder and if you press a key softer it will play quieter. Do I need a full drum set to take drum lessons? A full drum set is not necessary. Many students learn on practice pad kits. These are round rubber pads that simulate the feel of hitting drums. How long does it take to learn? There is no sure answer here. Of course regular practice will give you the best results. 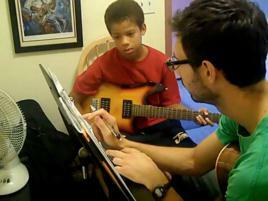 Weekly music lessons are also the best motivator to attain your goals. I don’t have any musical background or ability; can I still help my child practice? Yes. Even if you don’t have a musical background you can ask the teacher for advice on how to help your child practice. By simply monitoring that they are doing exercises a certain number of times per day the student will progress.